- all fresh greens and pops of yellow and shots of blue - are perfect for pages about getting outside, so I looked for out and about pictures and first of all I found this one, which I took last summer when we were stuck in a traffic jam. I have a thing for Highland cattle, so I couldn't resist. in which I paired a photo of Molly Malone with a note of our favourite St. Patrick's Day feast. It'll soon be time to fry up a batch (and what this page really should note is that it has to be eaten fresh for best deliciousness). I don't often do themed embellishments, but how could I possibly resist? We're off on a road trip this weekend and I'm hoping to collect some more lucky green stories. See you soon? 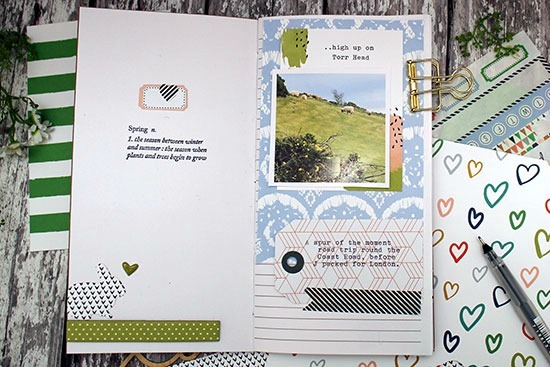 Everything today made with Main, Life Pages and Planner kits from March at Gossamer Blue. We have enjoyed your potato cake recipe several times now. Yes,they are definitely best when eaten fresh, but they do keep well (if you can resist the temptation!). Ah, spring colors are certainly welcome here. We, too, have a stiff breeze blowing, but it's blowing in bitterly cold weather and some snow. What a lovely way to use a Traveler's Notebook! Have a great time this weekend. Your Traveler's Notebook is starting with a WOW beginning; really like that first page of the sheep on the hills. Of course the big layout is quite delightful (I'm with you on the highland cattle) & oh yes to potato bread, but I will take my toasted, thank you very much. Happy weekend roaming. It's wonderful to see such lovely spring color. We should be seeing some around here soon, I hope. It definitely pairs well with outside photos and I hope you enjoy working in your traveler's notebook. love that notebook. i found your blog through ladkys. i am a fellow crafter and am so excited by all the possibilities that paper, yarn, material etc bring. if you like to visit it bev at www.blackinkpaperie.blogspot.com. 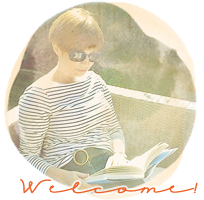 thanks, i'm off to poke around your blog some more! 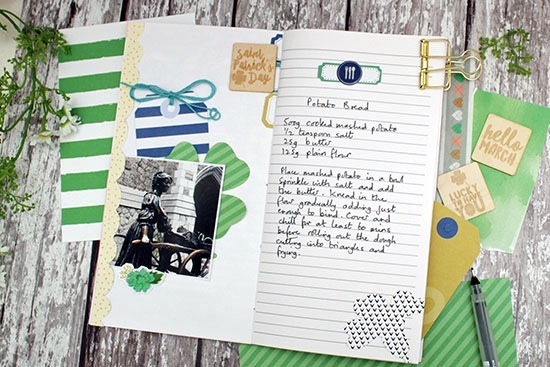 That kit is definitely perfect for "out & about" pages. The traveler's notebook looks great - such a FUN size! 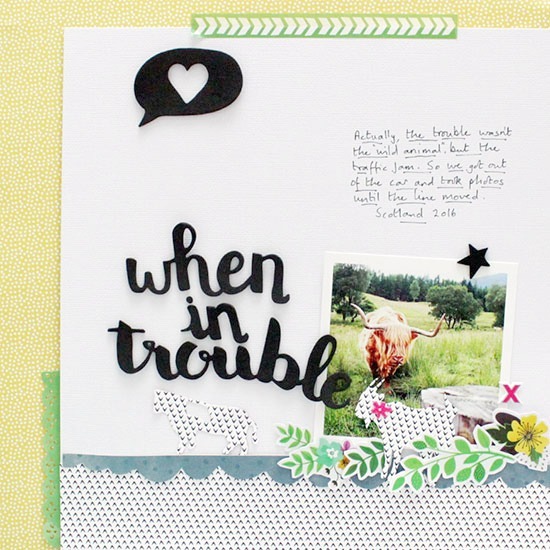 The 'cow' page is lovely and your travellers' notebook looks wonderful ... such gorgeous colours! Perfect greens for your Highland friend ... and I am always interested in your lovely Traveller's Notebook, of course. Ah, potato bread! My Mum used to cut ours with a fluted scone cutter, so they looked like little golden potato daisies :). Love both your beautiful new layout and your TN! Would love to see more of your TN!! What lovely colours and as usual your layout is so great to look at. I haven't really been keeping up so a travelers notebook is something for me to go look up.